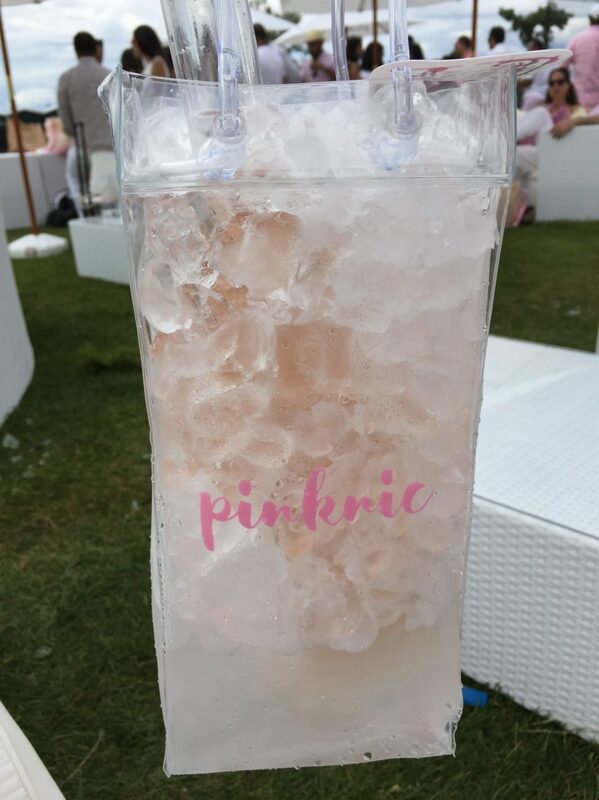 Don’t know what Pinknic is? 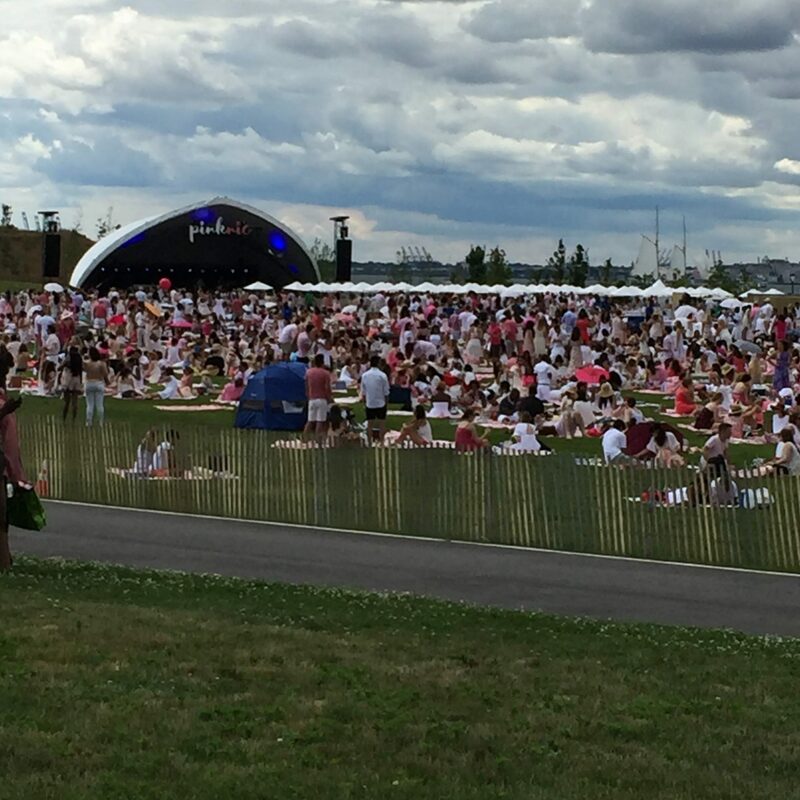 It was the large-scale rosé themed picnic intertwined with music on Governor’s Island this past weekend. WHAT WILL THEY THINK OF NEXT?! To tell you the truth, it was awesome. Why was it awesome? Probably because it was different. I’ve been attending events and festivals for a long while in this town (read: old), and I can safely say that I am not only jaded as a consumer, but also pretty cynical by nature which leaves me unimpressed by most things. It’s a fun existence. Did I mention there’s a strong focus on the food and drink?! So clearly I am the target audience for an event like Pinknic, and the perfect person to review it. Here are 9 things you should know about Pinknic – what to expect, what to avoid, etc. This is assuming it comes back around next year, which I hope it does. And why 9 instead of 10? Because odd numbers don’t get enough love. Obey the wardrobe: pink and white. Normally I think things like that are silly, but I gotta admit, it looked cool. In pics and even from afar – walking up to the event and seeing everyone decked out in these colors made me feel like I was part of a really weird and cute club. 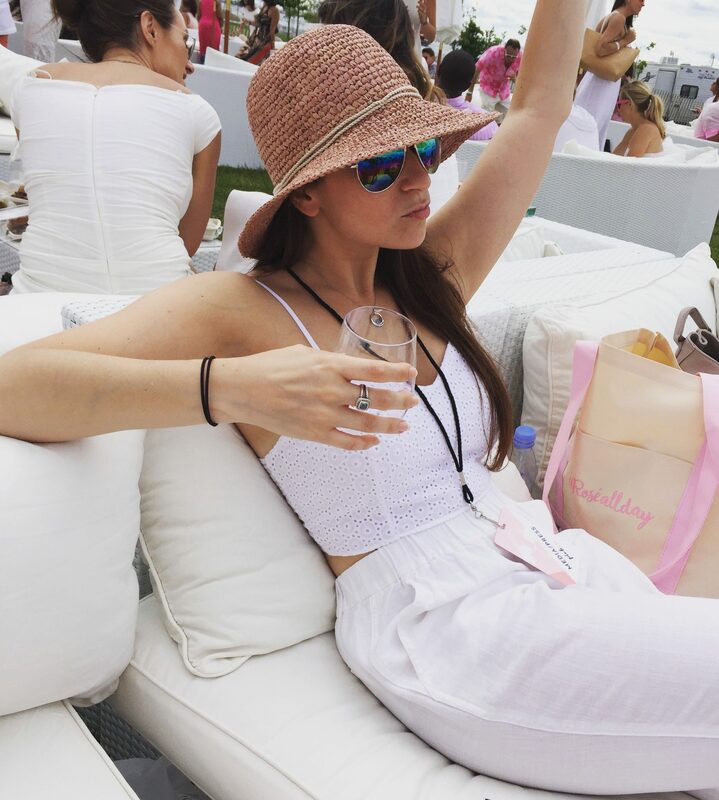 They stop serving alcohol at 5, so stock up on your rosé while you can. NO outside liquids obviously, so everything must be bought inside. 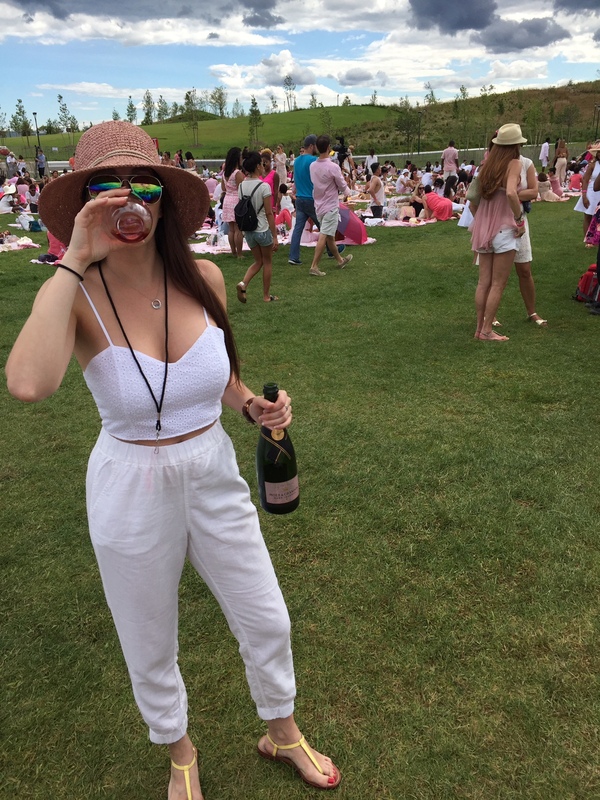 You have to buy the rosé when you get there, and personally, I think including ONE glass per guest would be nice upon entry, but at the same time, I can see how that would be annoying and maybe hold up the process. Because right now, the check in process was super easy and breezy. Nothing grinds my gears more than a long line and there wasn’t one! No cash. 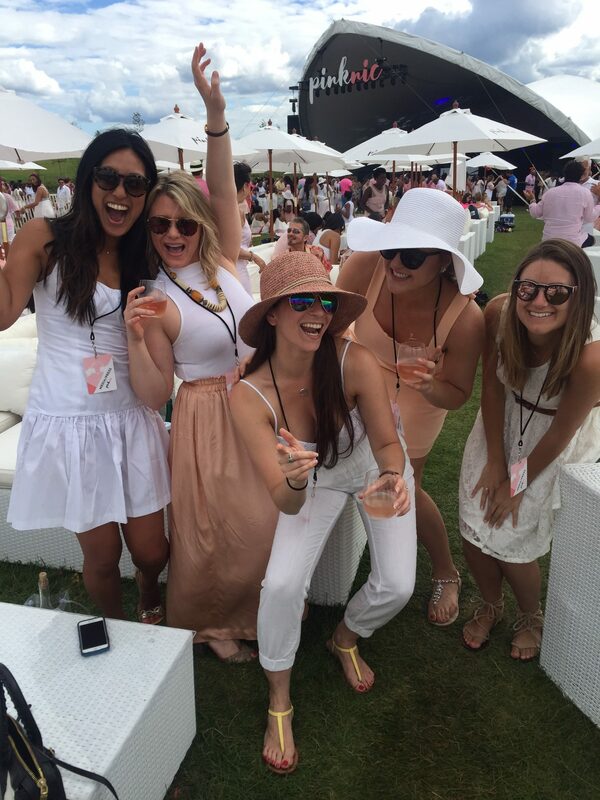 Credit cards only, and prepare to overspend slightly – that rosé goes quick and before we knew it we bought 3-4 bottles. Oops? Sunblock. There is very little shelter from the sun (#governorsisland), and fortunately we had an overcast day, but if it was sunny, we would have been roasting. Dress comfy. Lest we forget this is a large-scale picnic with music. You will most likely be sitting on the floor aka grass (with or without blanket) or dancing to some sweet tunes (this year we saw Claptone and Miami Horror!). To that end, I don’t recommend heels, ladies. If you can pull it off, go nuts, but the walk from the ferry to the Pinknic area takes 10-15 mins, and again, heels on grass is annoying. Wedges or chunky heels only. I also hate heels so any opportunity to NOT wear them is ok by me. Buy the picnic basket. Trust me. I had friends who opted out of eating (dummies), and I think they are still walking around covered in regret. Created by Chef Chris Santos of Vandal, the food was delicious and fresh, even by the time we scooped it up. We were supposed to get the VIP basket, but again, we got there so late that they ran out of it. So we opted for Basket 2, which was my second choice anyway: shaved sirloin sandwich with mustard aioli and onion marmalade on a pretzel roll, grilled peach and burrata salad with tomatoes, toasted orzo salad with olives and feta, BBQ chips, and summer berry streusel bars. Did I mention it comes in a “rose all day” tote bag?! TOTES. If you can do VIP, do VIP. I think that’s a general rule of life, no? There was a nice area sectioned off right by the stage with big white couches and tables, and we managed to snag one! Even with our late arrival, you can count on us to stalk people who might be leaving soon and then swoop in and claim our territory. It was the perfect ambient noise level, the people were not overly rowdy, and it was right next to the bar area (but don’t worry, there are many bar areas). It’s clean. Considering the amount of trash that accumulates during a picnic, they were pretty damn good about cleaning up after people. Our area in VIP was a mess when we got there, and we told a worker and 2 seconds later he was there with a garbage bag and picked up EVERYTHING. Respect the hustle. I think that’s about it. 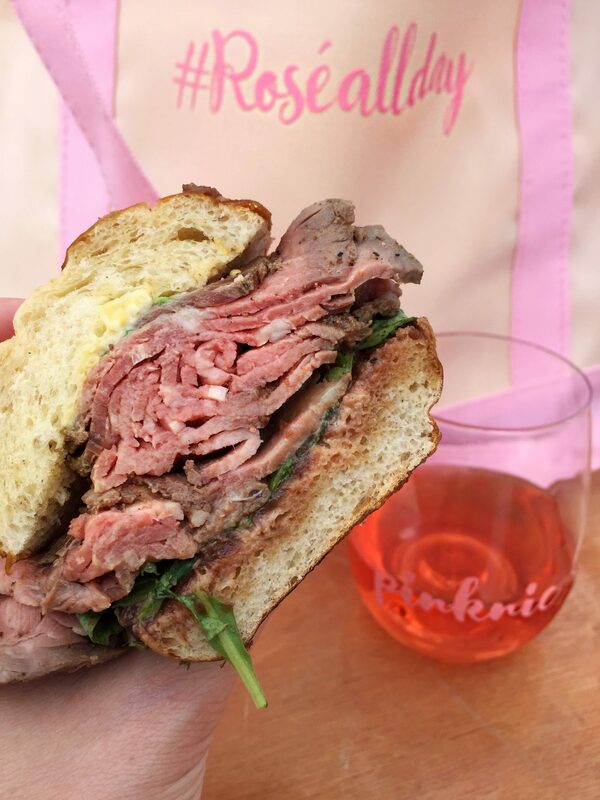 All in all, we were SUPER pleased with Pinknic, and like I said, I am fairly tough to please in this department because I am impatient and hate crowds. Next year, I would advise them to not oversell it, and to make sure they have enough supplies on hand, just in case you’re dealing with people like us who arrive a bit-too fashionably late. Speaking of fashion – check out my girl Chelsea’s fashion blog, Ready to Ward. She attended with me! If you don’t mind me asking how much were the bottles? Were they strict with ID’s? Meaning, if you’re underage? lol yes then pretty strict! What were the differences in the VIPs ( GARDEN VIP LOUNGE, POOL VIP LOUNGE, LES CABINES & POOL LOUNGE) Besides that you are near a pool and access of the pool. How is the seating? Which VIP has actual sofa seating and not just blanket sitting with a umbrella? Thank you that will help. You probably can check their site and tickets page for more detail, because I didn’t go last year – this is from 2016 – and I think they changed a bunch of things! But all VIP areas had some sofa seating, but you had to claim a spot. Or wait til people leave and swoop in. There definitely were people in VIP that were standing.